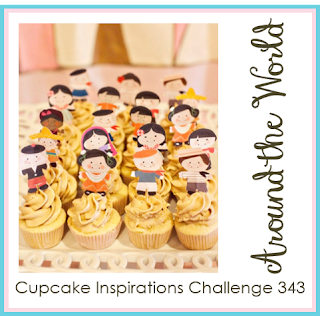 It's Sunday again, and time for another Cupcake Inspirations Challenge! 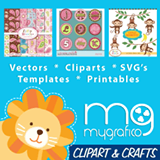 This week's Sponsor is My Grafico! Aren't these cupcakes just so lovely and yummy!? 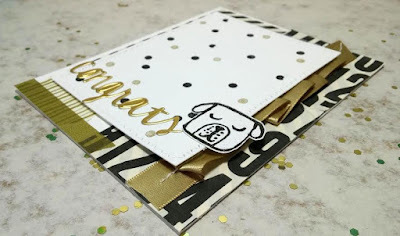 This card was so much fun to make! The sponsor generously provided us some cute digi stamp sets, thank you! 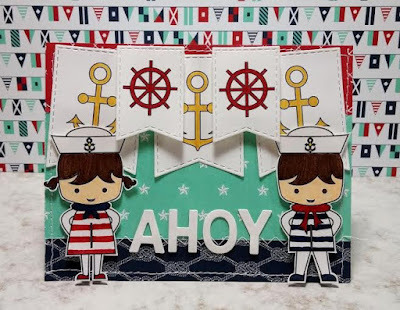 and I chose this super cute Sail Away With Us set! 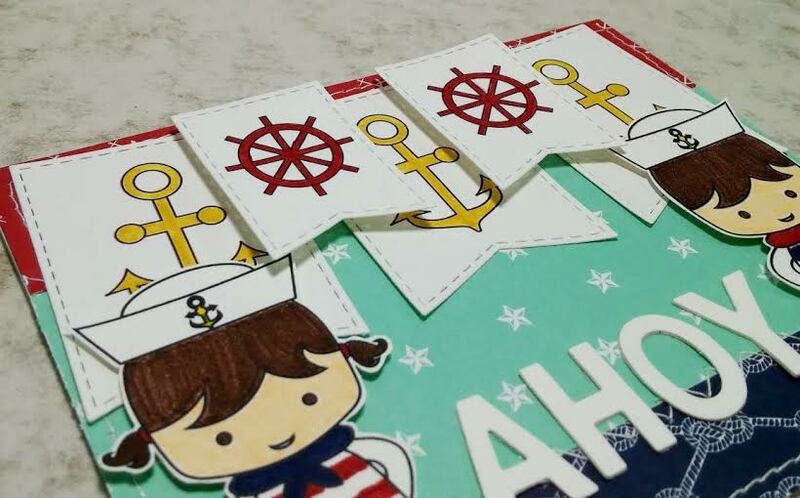 This set has so many nautical images from boats to anchors to cute sailors! 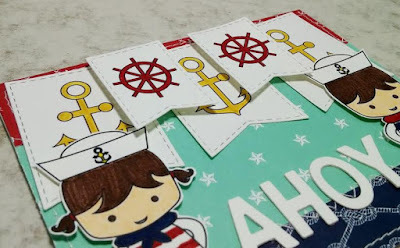 I printed some images small and die cut with my banner dies to make a banner. 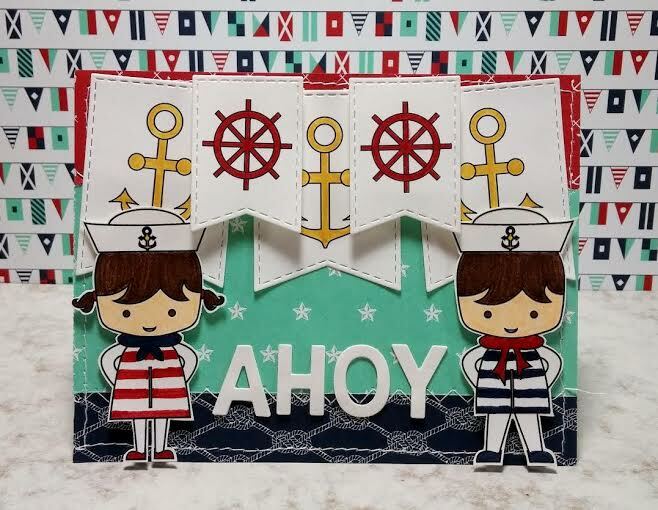 I had to have these cute little sailors! So stinkin' cute!!! 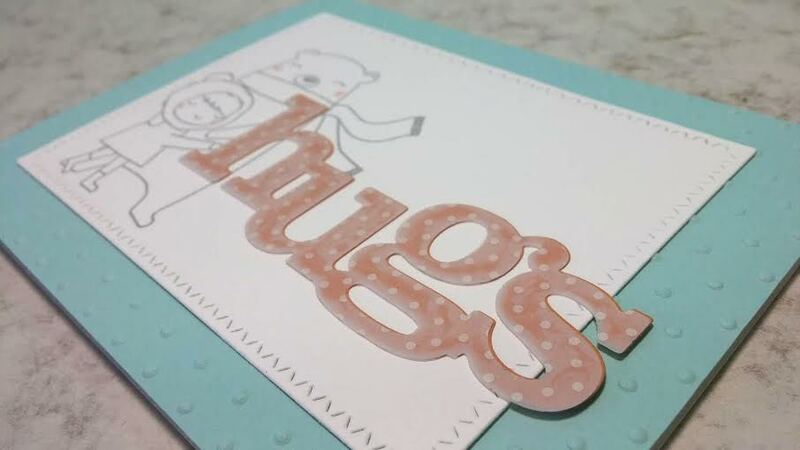 After assembling my card, it was missing something so I die cut ahoy. Isn't it perfect!? 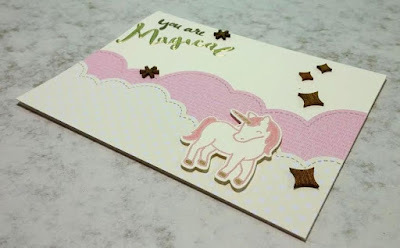 Don't for get to check out the rest of the sweeties beautiful cards with banners over at the Cupcake Inspirations Challenge blog! 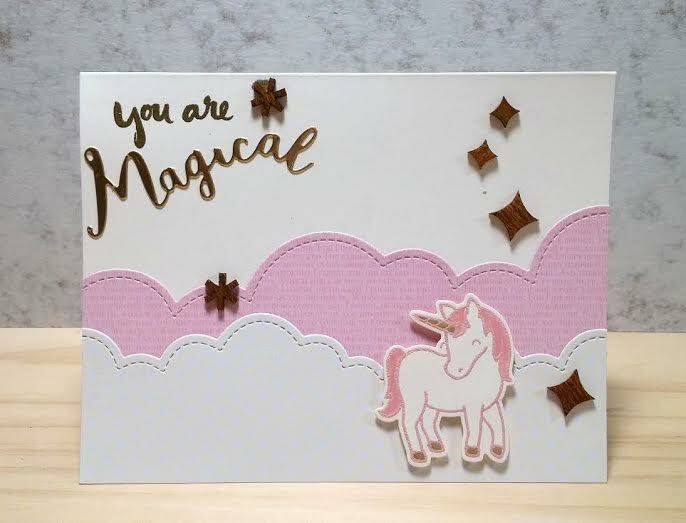 I am making a quick stop to share this card I made for Freshly Made Sketches! This is such a brilliant sketch! I wanted to focus on the sentiment. 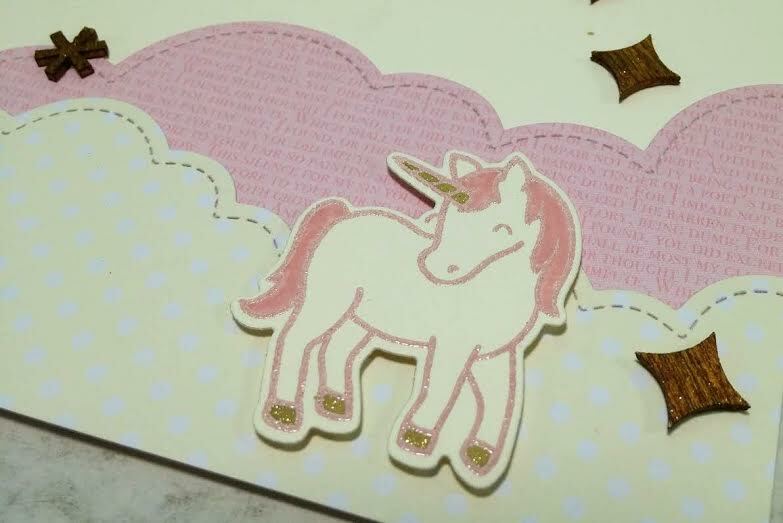 I die cut in Peach Parfait and design vellum. 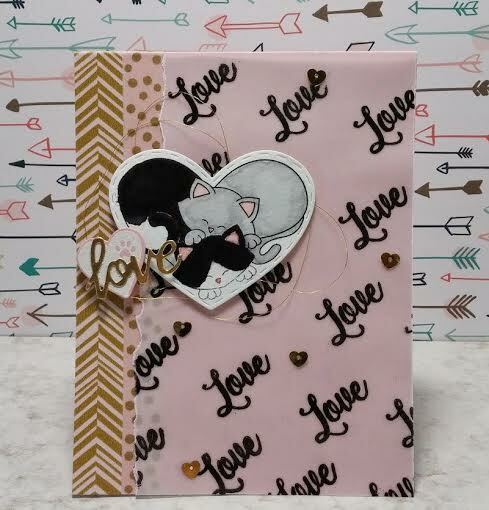 I stamped it as my background since I wanted the sentiment to pop, so all I wanted was their cheeks being blushed ;-) And that explains why I stamped it with light gray instead of black too. 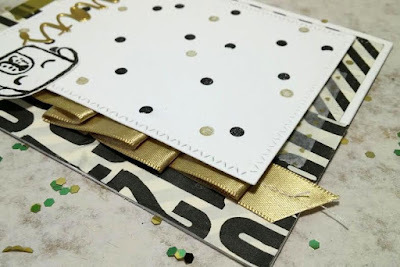 I also didn't want too many layers, but leaving the Pool Party cardsrock plain was, well, too plain! So I embossed it with the Perfect Polka Dots Embossing Folder to match the polka dots on the vellum. I love it! Hope you're having a lovely week! 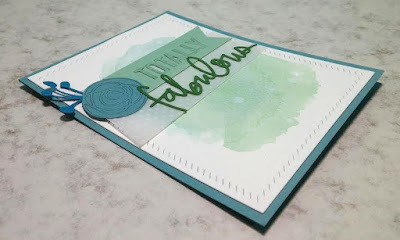 Today I am playing along with the Throwback Thursday Challenge over at WPlus9 Design Studio for the very first time! 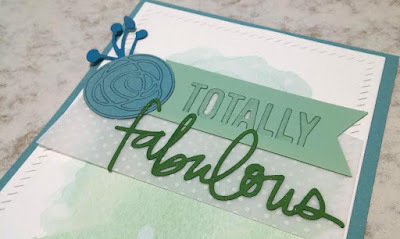 On their blog, one of their DT members has 3 samples made with this stamp set above. 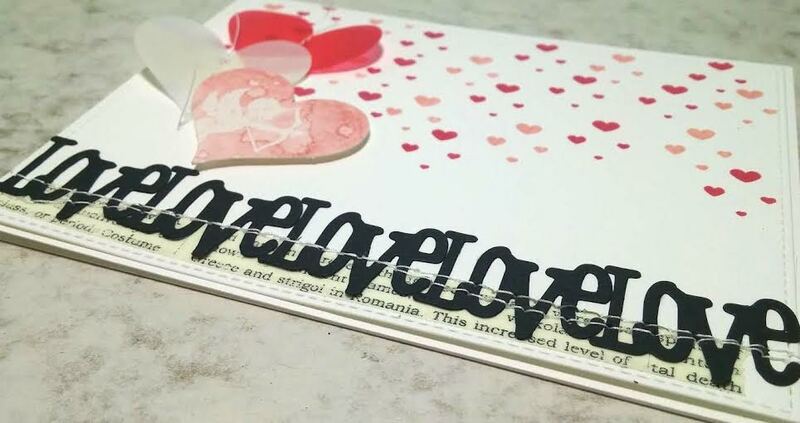 You can use one of her samples as inspiration, even use this stamp set if you own one, and just start creating with something old that needs some love and ink! I was inspired by 2 of the samples. 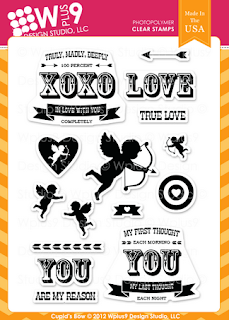 My choice of "oldies but goodies" is that cupid stamp from P.S.I Love You by Stampin' Up!. Here is my "oldies but goodies", my cupid. I water colored a piece of watercolor paper with Crisp Cantaloupe then heat embossed him with white, then punched it out with the Sweetheart Punch. 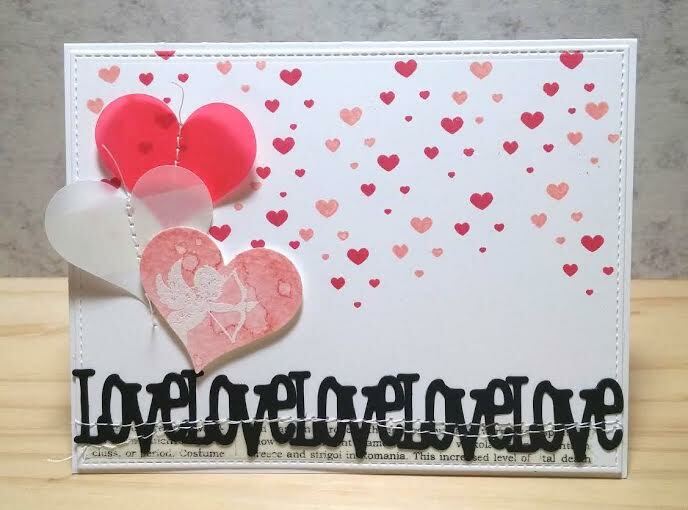 I wanted to add another heart behind it so used the pink vellum, then I wanted another one in white so used the patterned vellum. 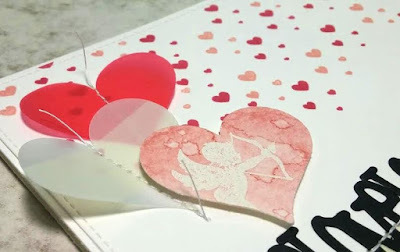 I adore the look of stitches on hearts so that's exactly what I did with the vellum hearts. 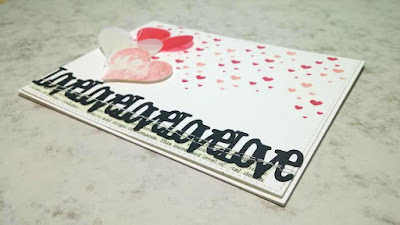 The background was stamped with this little cluster of tiny hearts from the Smart Kitty Stamp Set. This card design was inspired by the 2nd sample, it was just so clean and adorable! 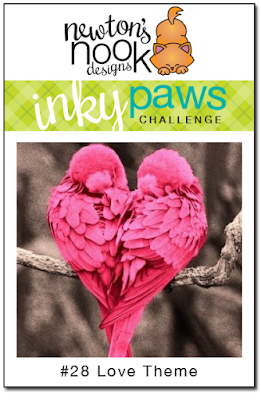 I have a sweet card filled with love that I made for the Inky Paws Challenge over at Newton's Nook Designs today! 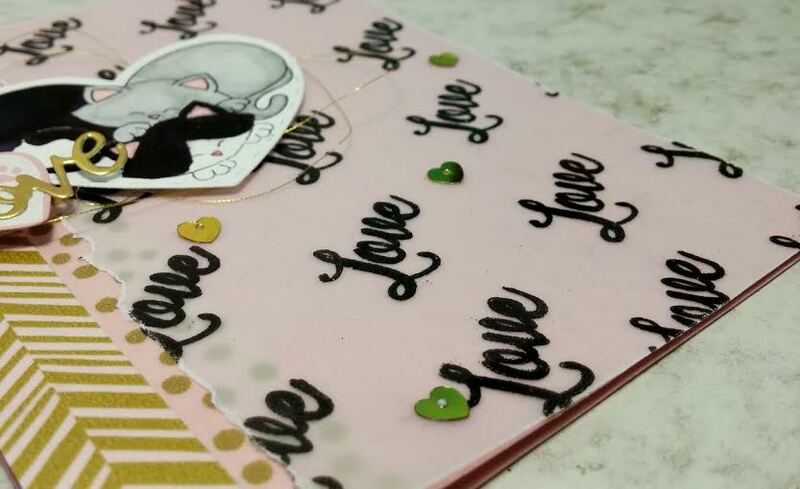 Valentine's day is in a few weeks, this theme is so perfect! Does this scream love or what!!? This super adorable image is from their new release Darling Duos, they even made a heart die to fit perfectly around these cuties! I placed my order as soon as they became available! I stamped the image with Stazon then colored with the black and light gray Kuretake Watercolor brushes, and the Blushing Bride Stampin' Marker. 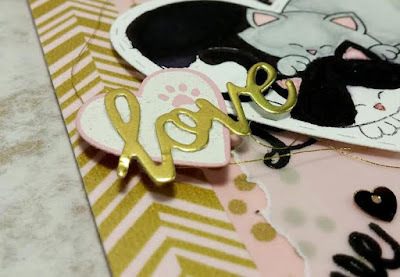 This small heart with a paw print is from the same set, I heat embossed with white on Blushing Bride, then die cut it with the die that came with the bigger heart. The sentiment also came with the same die set, so pretty! This love stamp is also from the Darling Duos stamp set. 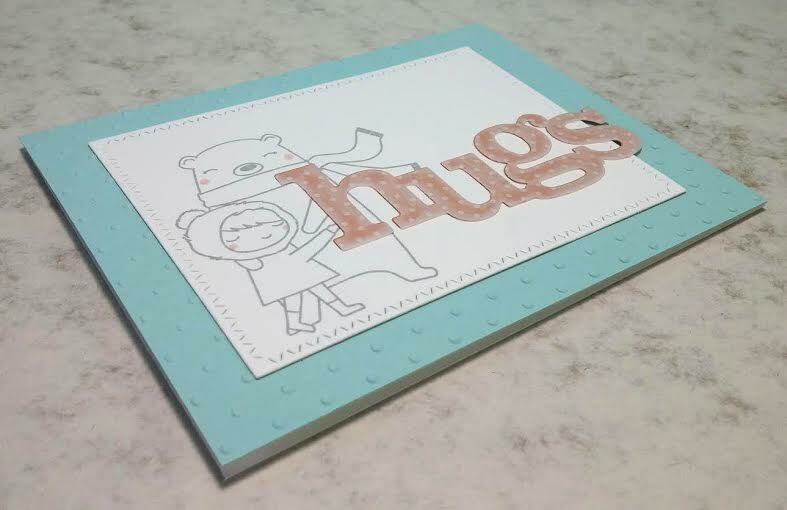 I heat embossed it on vellum to make my own background. It's time for another Cupcake Inspirations Challenge! This week's sponsor is Freckled Fawn! Ooooh, isn't this just so yummy!? I love these fluffy, cotton candy like clouds, yum! 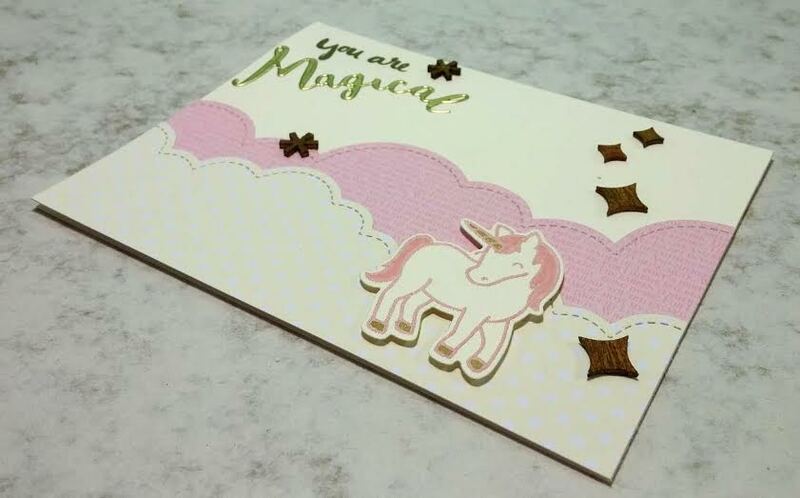 I chose to use the unicorn because the color combo was sweet and girly, I thought fairy tale was perfect ;-) I heat embossed this cutie with Blushing Bride emboss powder on Very Vanilla, colored his tail and mane with the Blushing Bride marker, and the magical horn and hooves with the Gold Glitter Pen. isn't he just darling!? 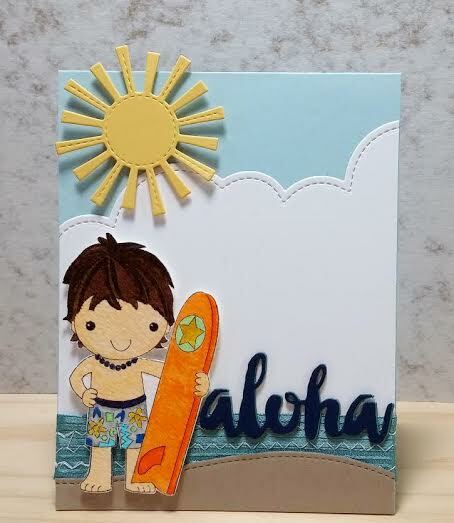 This sentiment die is from Waffle Flower, I wasn't sure if I'd ever use it but just had to have it! LOL So yay for using it! 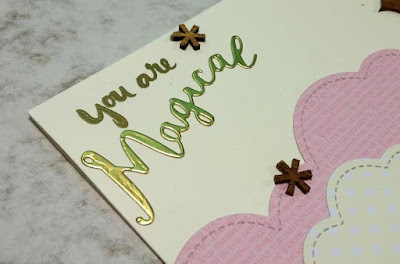 :-D "you are" was heat embossed. 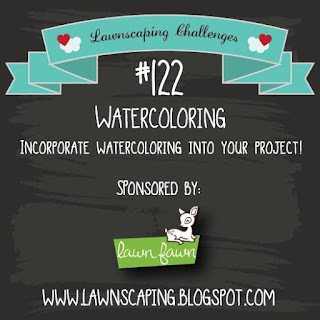 I am playing along with the Lawnscaping Challenge today! I had wanted to use my rainbow die since I got this months ago! 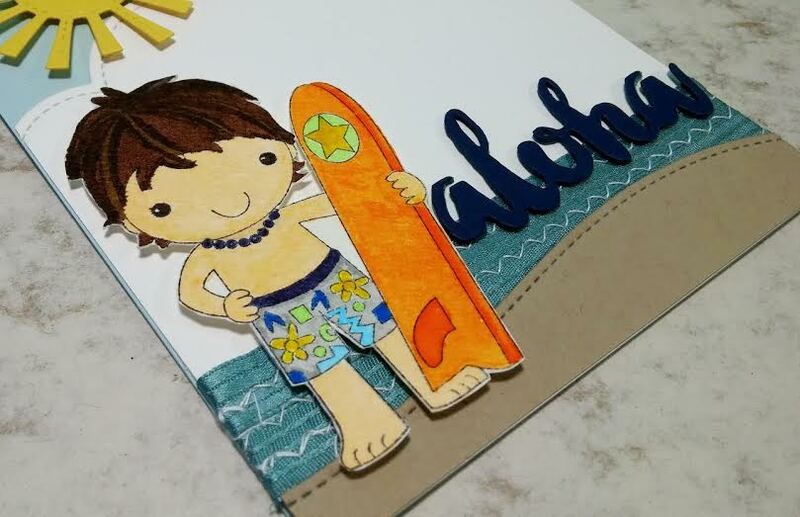 I die cut it in watercolor paper, then colored each line individually. 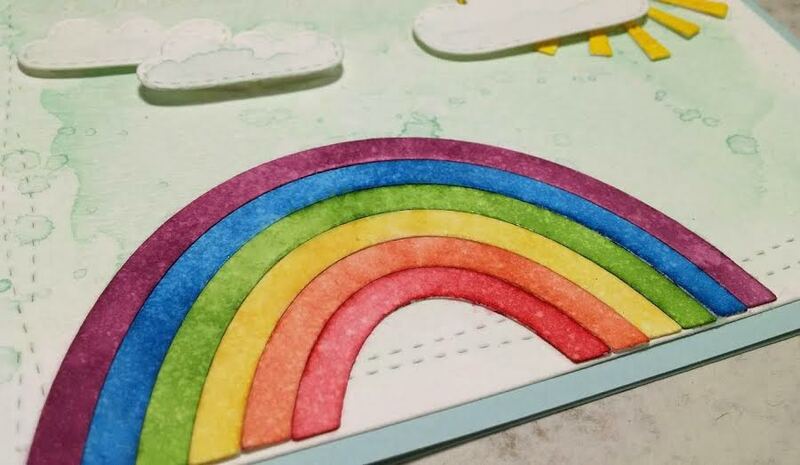 After assembling the rainbow back together, I sprayed some water with the spritzer on it. 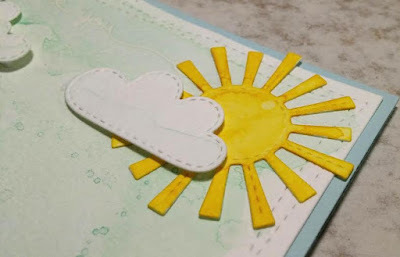 The sun and clouds were die cut then water colored also. 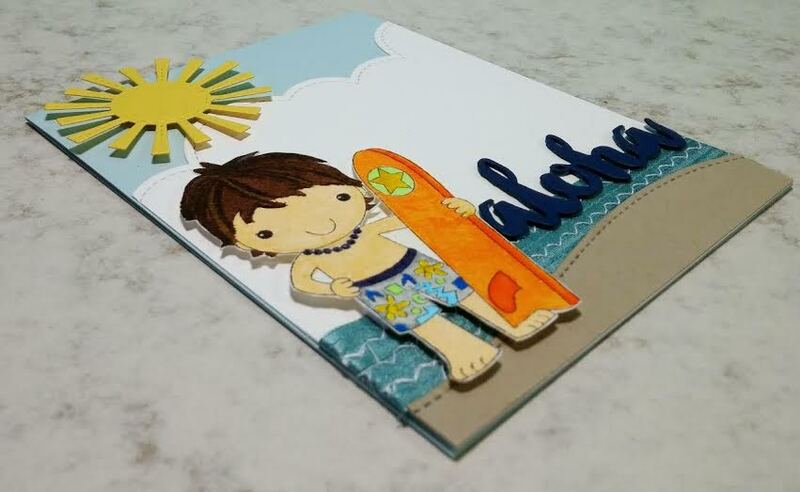 I water colored the background with Soft Sky, but it turned out to be a lot more green than blue like Pool Party! 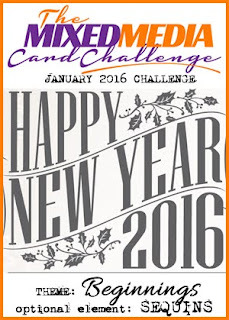 Today I am just in time for a few challenges! 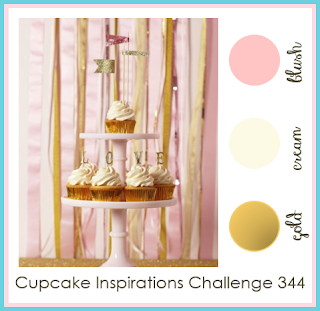 First up is the Mix It Up Challenge over at Ellen Hutson! They're mixing things up with My Favorite Things this month! I got some inspirations from the Sketch Challenge over at My Favorite Things. Also from the Color Challenge over at My Favorite Things! I loved this sketch! Simple sketches give me more inspirations! 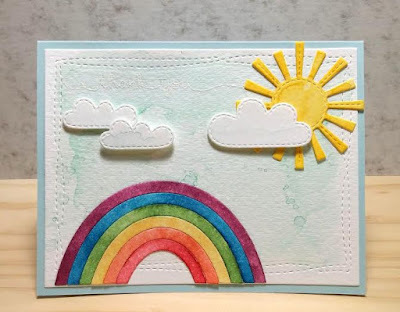 And I would have never used those colors together on my own! 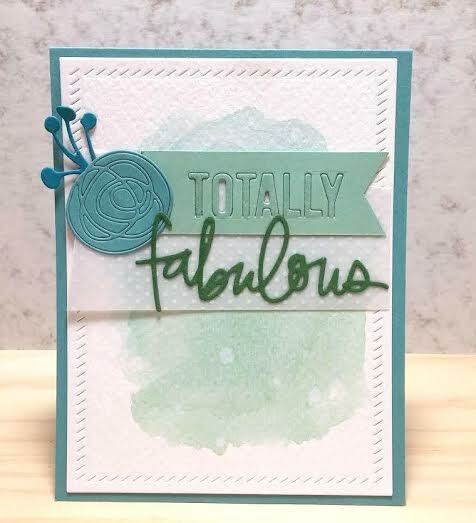 Isn't this sentiment totally fabulous!? It was Ellen Hutson's Black Friday freebie! I die cut totally in Mint Macaron, fabulous in Garden Green. I then die cut my scribble flower in Lost Lagoon, and little buds in Island Indigo. I mounted all the die cuts on my go-to vellum, then brushed over the sentiment with the glitter pen. 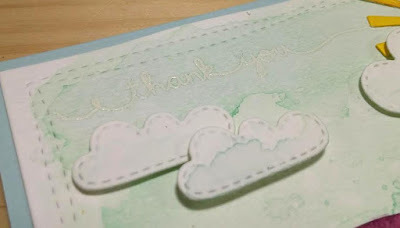 The background was water colored with Lost Lagoon and Mint Macaron, isn't it pretty!? I never realized that Lost Lagoon had so much green in it! I love how this card turned out, totally fabulous! 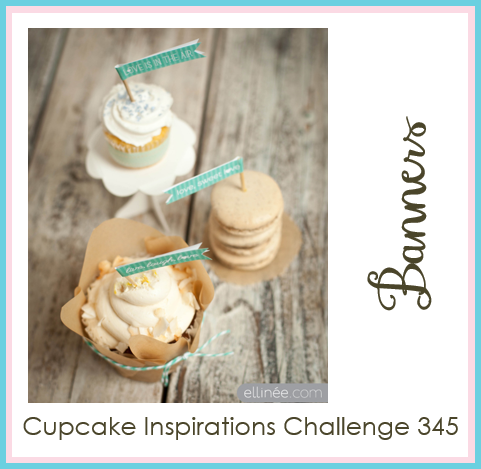 It is time for another Cupcake Inspirations Challenge! 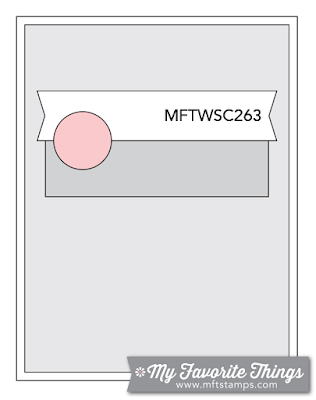 This week's sponsor is Your Next Stamp! 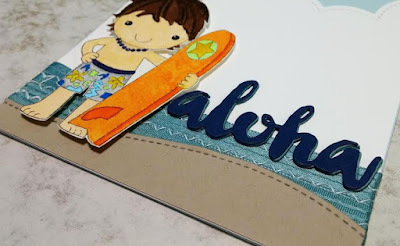 Do you love this week's theme as much as I do!? So stinkin' cute and fun! Besides, look how well they worked! 1: My twin boy's name is Kaius, and we call him Kai :-) It is a hybrid of the names Gaius, and Kai, which means ocean in Japanese! I stamped him with Stazon Jet Black and colored him with my Kuretake Watercolor Brushes. As much as I love this sentiment die, I don't get to use it as often. I die cut in Midnight Muse and Lost Lagoon, and layered them for a little dimension. 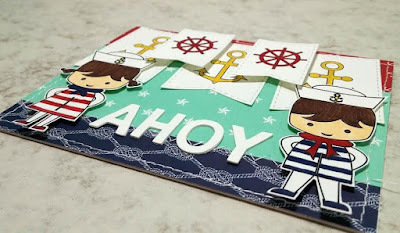 And here is my favorite part of this card! I sewed 2 pieces of Lost Lagoon ribbon with zig zag stitches, which look like waves in the ocean! 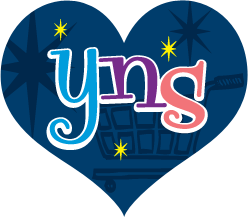 The sketch from YNS was really perfect! I wish I could be there with Kai!!! Don't forget to head over to the Cupcake Inspirations Challenge Blog to see what other countries you get to visit! 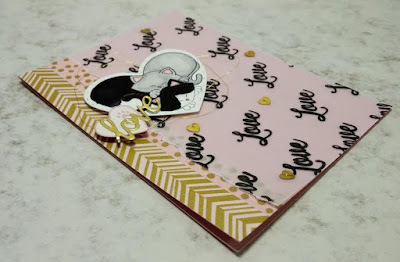 I am also playing along with the Mixed Media Card Challenge again! Her nursery is black and white with a dash of gold. It is so chic and pretty! She has this black and white comforter that has a cute little face of French Bulldog on it, and I love it! 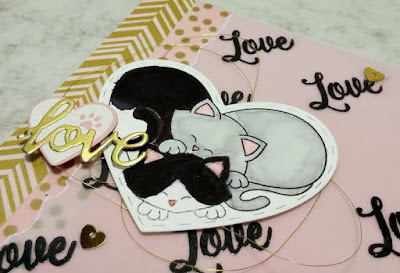 I have this stamp set from the cat bundle I bought from Studio Calico, even though he's not a French Bulldog, he's still super adorable ;-) I heat embossed him with black rather than just stamping with ink, just to add some texture. Some gold washi tape was applied on that little corner because it looked bare, and more texture. She just put up these black vinyl polka dots on one of the walls in the nursery, it is super cute! 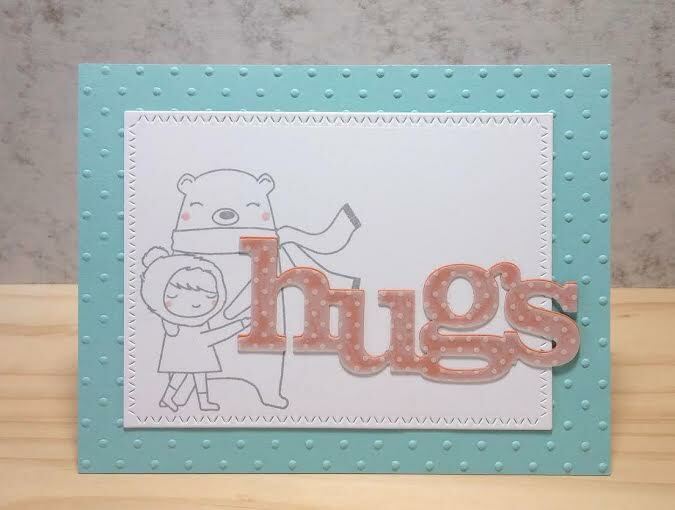 I used one of the dots from the Cool Dudes Stamp set to mimic that wall. 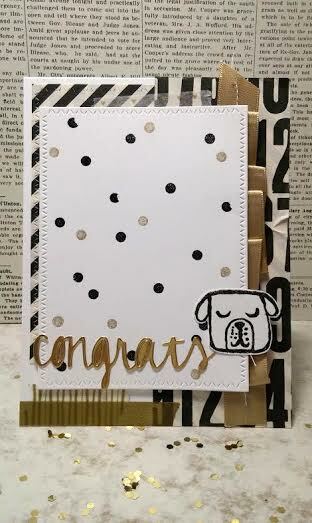 I randomly stamped the dots with Versamark on the Whisper White cardstock then heat embossed with black. 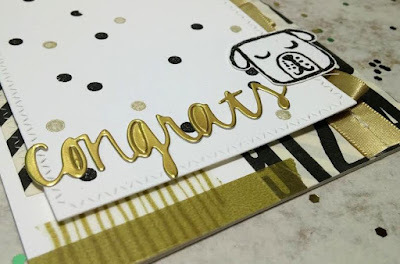 Her wall doesn't have gold dots, but I felt like adding them on my card. I pleated the gold ribbon and sewed it down to kind of break up all the black and white going on. I also added that cute white with tiny gold heart washi tape. I hope the new mama loves this card as much as I do! Hello there! I'm glad you stopped in! 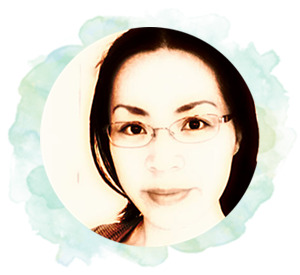 My name is Nakaba Rager, but most people call me Naki ;-) I have been married to my very hard working husband for over 18 years and we have a beautiful son, boy/girl twins, and a baby girl. This blog is to share my ideas and hope to inspire you, so please enjoy :-D I also LOVE and appreciate your sweet comments! Thank you!